Remember a few weeks ago when I wanted to make something with squash blossoms, but I had just planted my garden and there were none to be had? Around the same time, I started reading The Secret Book of Frida Kahlo (for September Cook the Books Club). And I watched the movie, Frida (for September Food ‘n Flix) and became mildly obsessed with Mexican painter, Frida Kahlo. After reading a fictional book and watching a movie about her life, I was desperate for facts. So I found a massive but fascinating biography about FridaKahlo AND I bought the book, Frida’s Fiestas. Frida’s Fiestas is a book of recipes and stories of Frida Kahlo as remembered by her step-daughter Guadalupe Rivera. After reading a fictional account of Frida’s life, and following it up with an interesting, “just the facts, ma’am” biography, reading a story by someone with a very personal connection to Frida Kahlo was really neat. It filled in the gaps left by the other two books, and made Frida a real person. Frida’s Fiestas features color photos focuses on a year in Frida’s household and the parties and holidays she cooked for and celebrated. 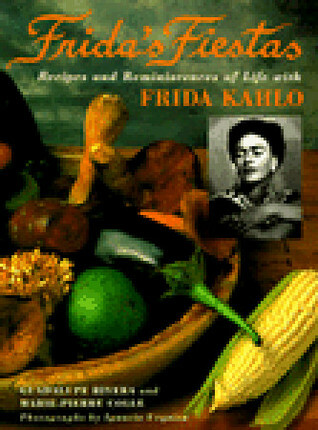 Then it’s followed up with full color photos and recipes (supposedly recipes that Frida herself actually prepared). There are also many photos of the Frida Kahlo museum and some of Frida’s artwork. It’s really a neat read! As I was reading the book, I quickly realized that these are truly authentic Mexican recipes, meaning a) my family will never eat this, b) the recipe could feed an army, and/or c) I’m never going to be able to find those ingredients locally. Then fate smiled upon me. First, I was reading the biography of Frida Kahlo and Squash Blossom Quesadillas were mentioned. I was super excited since I was wanting to cook with squash blossoms anyway. I ran outside and there was one blossom. One. 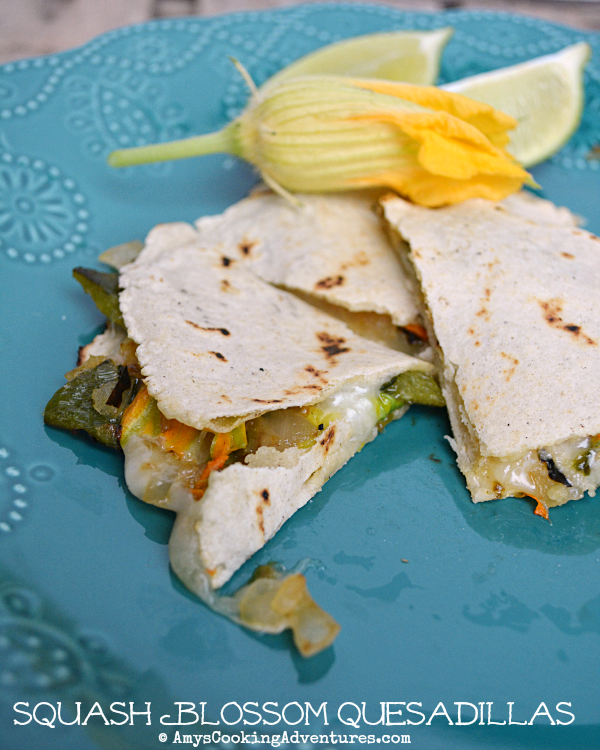 Later that same night, I picked up Frida’s Fiestas and what did I find as part of Frida’s Christmas dinner, but a recipe for Squash Blossom Quesadillas!!! The next day, there were more blossoms and three days later (by the time I gathered my remaining ingredients), my zucchini and yellow squash plants were bursting with blossoms!! I love how things just work out sometimes! The quesadillas (well, my slightly Americanized version) were delicious! I loved the play of ingredients. The spiciness of the peppers blended beautifully with the creamy cheese and the light squash flavor of the blossoms! I am so happy I was finally able to cook with this ingredient! 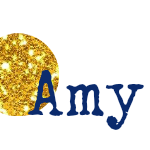 I’m submitting this post to Foodies Read hosted by Based on a True Story and Food ‘n Flix hosted by Evelyne at Cultureatz. Whisk together the masa harina and salt. Add the water and knead until the dough feels similar to play-doh. Divide the dough into 8 equal sized balls. Heat a dry skillet over medium heat. Place a dough ball between 2 pieces of plastic (I used 2 zipper bags) and roll very thin, to about a 6-inch diameter. 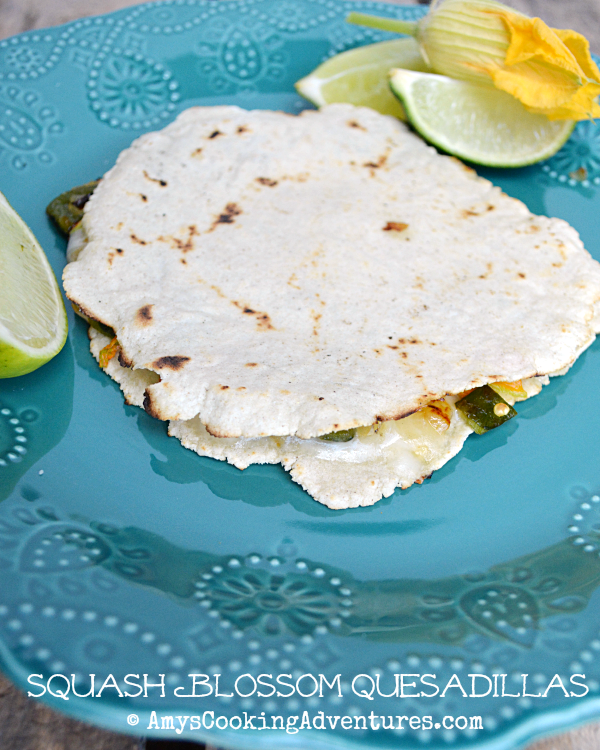 Alternately, use a tortilla press for uniformly shaped tortillas. Carefully peel the rolled tortilla off the plastic and place in the heated pan. Cook for 1-2 minutes or until it begins to brown. Flip and cook for another minute until the bubbles brown. Remove to a plate and cover with a towel to keep warm. If not using right away, cool and place in a zipper bag and refrigerate. Place the serrano and poblano peppers on a baking tray on the top rack of the oven. Broil until charred on all sides, turning the peppers as necessary. Remove from the oven and cover with foil for 15 minutes. After 15 minutes, rub the skin and stems off of the peppers and discard. Chop pepper flesh and set aside. Prepare the squash blossoms by removing the stems, stamen, and tiny outer leaves. Roughly chop the blossoms. Heat the oil in a pan over medium-low heat. Add the onions and cook for 3 minutes. Stir in the peppers and continue cooking until the onions are tender. Stir in the squash blossoms and cook for another 1-2 minutes. Season with salt, if desired. To make the quesadillas, sprinkle the cheese over 2 tortillas. Split the squash blossom mixture between the tortillas. Top each with another tortilla. Heat a skillet over medium-high heat. Place the quesadilla into the skillet and place a heavy pot on top. Cook until the cheese begins to melt and the tortilla browns a bit. Flip and cook until the cheese is completely melted. (Alternately, use a Foreman Grill or panini press to cook the quesadillas.) Repeat with the next quesadilla. Makes 2 quesadillas with 4 corn tortillas left over. That sounds wonderful. I've never made my own tortillas. Oh I am so happy you found some squash blossoms! They are fun to cook with. Love this recipe got to try, and now I am curious to read more on Frida! I haven't started the book yet but it is on my nook waiting for me after which I will watch the movie. Looking forward to it. I hope I am inspired to make something as fantabulous as your quesadillas. 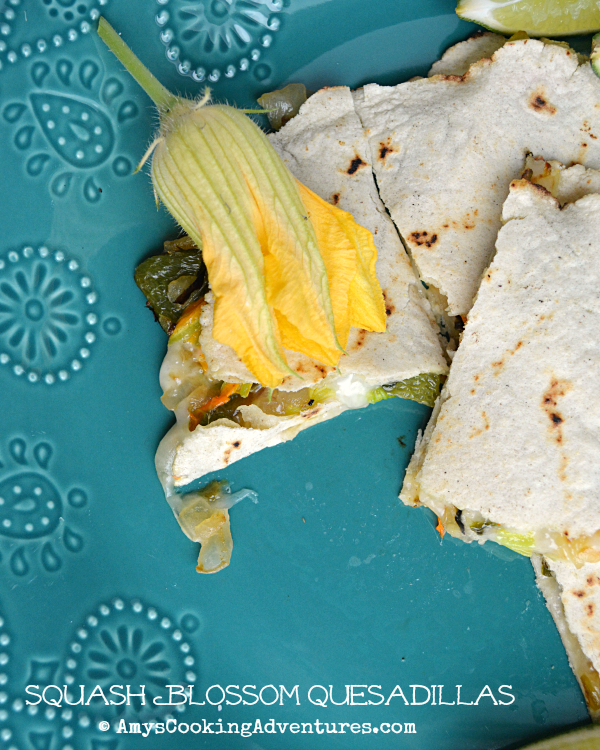 I go crazy when I can get my hands on squash blossoms (and quesadillas with them are my kids fave). This look wonderful! I'm also a big Frida fan, so I'm really looking forward to that month(s)! I have stuffed and deep-fried squash blossoms when I can find them but I have not tried them in a quesadilla. It looks delicious with the cheese and chili peppers.